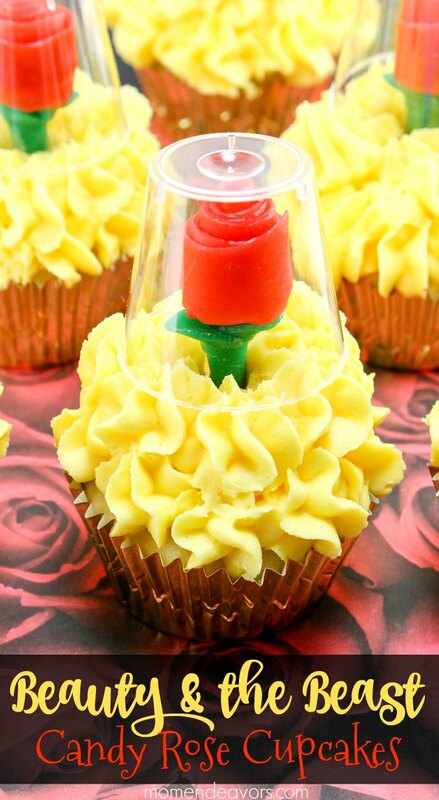 Disney’s live-action Beauty and the Beast hits theaters this Friday (March 17, 2017) and we’re sharing these candy rose Belle-inspired cupcakes to celebrate! 1. 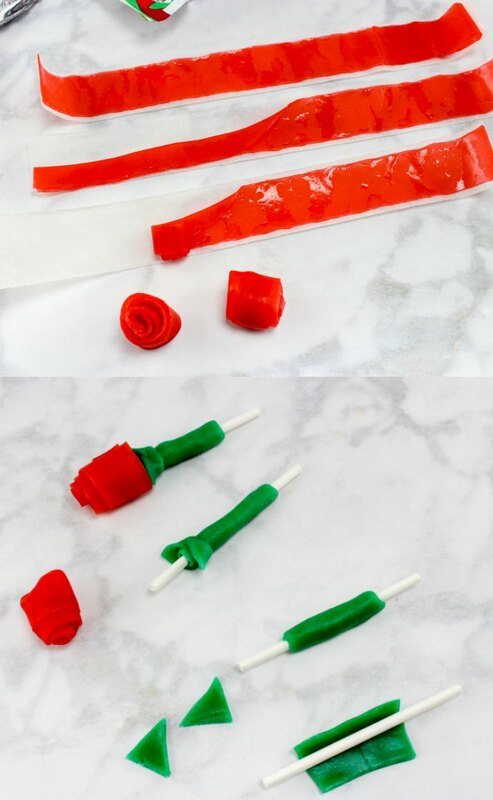 For the roses, unroll a fruit roll-up, fold in half lengthwise. Then starting at the folded end, roll up making the layers a bit uneven so it resembles a rosebud. 2. Take the lollipop sticks and cover the middle of it with a small piece of the green Airhead candy. Cut tiny triangles and press onto the green stem to look like leaves. 3. Place the rose down over the sucker stick – making sure the green stem and red rose top touch. 4. Prepare the frosting by adding yellow food coloring and stirring well. 5. Frost the cupcakes. If you want it to look fuller (or ruffly like Belle’s dress), use a piping bag and large tip to pipe large dots/”stars” of frosting all over cupcake. 6. Push the remaining “open” stick of the flower down into the cupcake and carefully place the clear cup over the flower until it rests on the frosting. 7. Enjoy right away or store in an air-tight container. Love it! 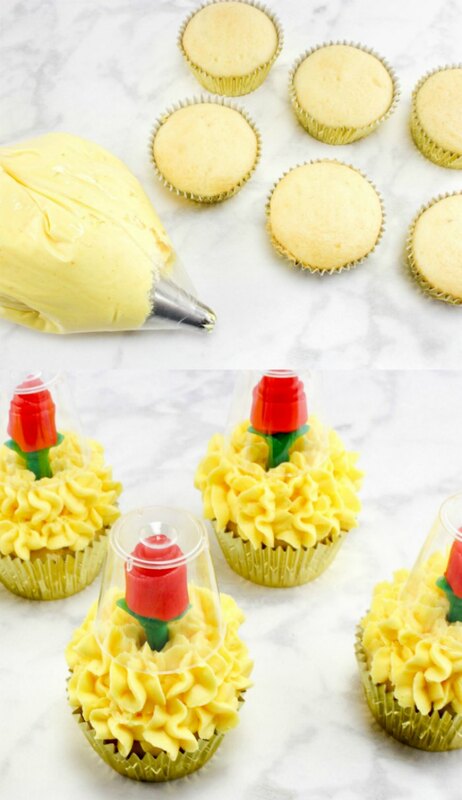 So enjoy these fun cupcakes and enjoy going to see the newest version of Beauty & the Beast – it’s SO good!!!!! 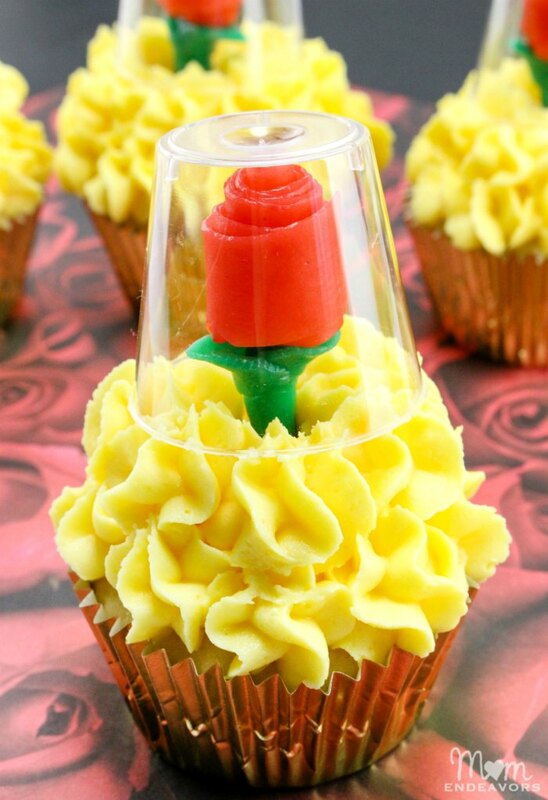 And for even more themed fun, be sure to check out these other Beauty & the Beast fun food ideas! I am very excited to try these. I am doing this next weekend for my daughter’s 6th birthday. Thanks for sharing this great idea!